All around was a great place to stay. It was clean and comfortable. The staff was extra friendly. The dribk machine on our floor didnt take bills (qaa supposed too) but otherwiae everthing was good. It is a nice place might come back. It is very quite and friendly services very clean. Location is very good easy drives to most of the city. The staff are excellent. The location is excellent...close to major roads, restaurants and shopping. The price is excellent, and it is well run. Great location for our purposes. Very quiet, comfortable. Easy access to highway. Clean and friendly staff. Good breakfast. Very close to South Edmonton Commons. Accessible to both South Edmonton Common and West Edm Mall. Location is particularly convenient if you are shopping at South Edmonton Common (IKEA, MEC, and many many other good stores). A little distant from most amenities, but right near the highway, so only a five minute drive to South Edmonton Common. South Edmonton Common is located in a welcoming area of Edmonton known for its beautiful river views and sporting events. The neighborhood is home to 34 hotels and other accommodations, so you can find something that works for your stay. Holiday Inn Express Hotel & Suites Edmonton South: This 2.5-star hotel features free breakfast, an indoor pool, and free WiFi. Our customers like its central location and WiFi. 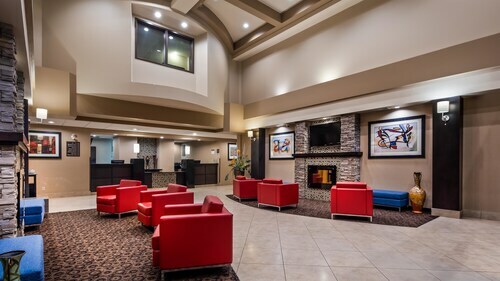 Travelodge by Wyndham Edmonton South: With a stay at this 2-star hotel, guests can enjoy access to free breakfast and an indoor pool, along with free WiFi. It's a favorite with Expedia travelers for its family-friendly amenities and overall value. Sandman Signature Edmonton South Hotel: With a stay at this 4-star hotel, guests can enjoy access to 2 restaurants and an indoor pool, along with free WiFi. It's a favorite with Expedia travelers for its convenient parking and quiet location. While you're in town visiting South Edmonton Common, you can discover the sights and attractions within just a few miles of the area. Southgate Center, Monster Mini Golf, and Alley Kat Brewery are a few additional nearby sights. Spend some time checking out University of Alberta, which is 5.6 mi (8.9 km) from South Edmonton Common, or make a stop by Rogers Place, located 6.9 mi (11.1 km) away. Flights from Deer Lake Regional to St. John's Intl. Flights from Pudong Intl. to Hong Kong Intl.